WASHINGTON (Reuters) - The White House on Friday warned Russia and other countries backing President Nicolas Maduro against sending troops and military equipment to Venezuela, saying the United States would view such actions as a "direct threat" to the region's security. U.S. Secretary of State Mike Pompeo has been given a list of options to respond to Russia's growing presence in Venezuela in support of Maduro, including new sanctions, said Elliott Abrams, the U.S. special representative for Venezuela. "We have options and it would be a mistake for the Russians to think they have a free hand here. They don’t," Abrams told reporters at the State Department. U.S. President Donald Trump earlier this week said "Russia has to get out" of Venezuela and said "all options" were open to force Russia to do so after two Russian air force planes carrying nearly 100 military personnel landed outside Caracas. Trump's national security adviser John Bolton issued a second warning on Friday in a strongly worded formal statement. "We strongly caution actors external to the Western Hemisphere against deploying military assets to Venezuela, or elsewhere in the Hemisphere, with the intent of establishing or expanding military operations," Bolton said. "We will consider such provocative actions as a direct threat to international peace and security in the region. We will continue to defend and protect the interests of the United States, and those of our partners in the Western Hemisphere," he said. 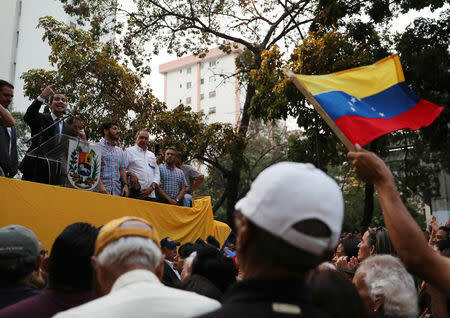 The United States and most other Western countries support Venezuelan opposition leader Juan Guaido, who invoked the constitution in January to declare himself interim president, arguing that Maduro's 2018 re-election was illegitimate. Russia and China support Maduro, who has said Guaido is a puppet of Washington. Maduro retains control of state functions and the country's military. Russia has said it sent "specialists" to Venezuela under a military cooperation deal but insisted they posed no threat to regional stability, brushing aside Trump's threat. Abrams said it was unclear whether Russia would continue to beef up its presence in Venezuela, noting that the newly arrived personnel appear to be trying to help Maduro's officials with a Russian-made ground-to-air missile defense system believed to have been damaged during recent massive power blackouts. "One of the things they are doing seems to be - and we’ve thought this from the very beginning - is helping the regime with the S-300 ground-air missile system, which apparently got all screwed up by the blackout," Abrams said. Abrams confirmed that U.S. officials have been having "conversations" with oil trading houses and governments around the world to convince them to further cut their dealings with OPEC member Venezuela. Oil provides 90 percent of export revenue for Venezuela. Years of economic mismanagement have left Venezuela's economy in shambles, causing hyperinflation. Severe shortages of food and medicine are common. Abrams said the aid was "very welcome" but said it was only the beginning of what was needed. "This aid is not going to solve the problems that Venezuelans face. The kind of aid that is needed for a broad recovery of the Venezuelan economy really can’t be put in place until the regime is replaced by a democratic government," he said.